* This recipe actually calls for macadamia nuts, but I am using what I have on hand. Waste not want not. I am on a mission, I am trying to get 6 loaves of bread baked this weekend. I will be going to see family next week and need more guinea pigs taste testers for the loaves I cannot eat myself. So this will be a largely high fiber baking weekend. The first loaf is in the Sweet Loaves chapter of the cookbook. I had some bananas that needed to be used up, so this sounded like a good loaf. The directions state that this is definitely a loaf for toasting, so I will be sure to share that with the recipient. The ingredients I used went into the bread machine in the following order: 1 cup milk, 2 tablespoons butter, cut into pieces, 7/8 cup sliced banana, 1 1/2 teaspoons salt, 2 cups bread flour, 1 cut whole wheat flour, 2/3 cup rolled oats, 2 tablespoons sugar, 1 tablespoon gluten and 2 1/4 teaspoons SAF yeast. I set the machine for a medium crust and sweet bread and let it start. When the machine beeped between Kneads 1 and 2, I added 1/3 cup chopped walnuts. As the baking began, the smell of banana was quite intense. As time went on, it either lessened, or I became used to it. It still smells lovely, but it smells more like a whole wheat bread than a banana bread. I know most banana breads I have eaten were quick breads which are usually far sweeter, denser and moister than yeast breads so I am very curious to see what my taste tester thinks of this. 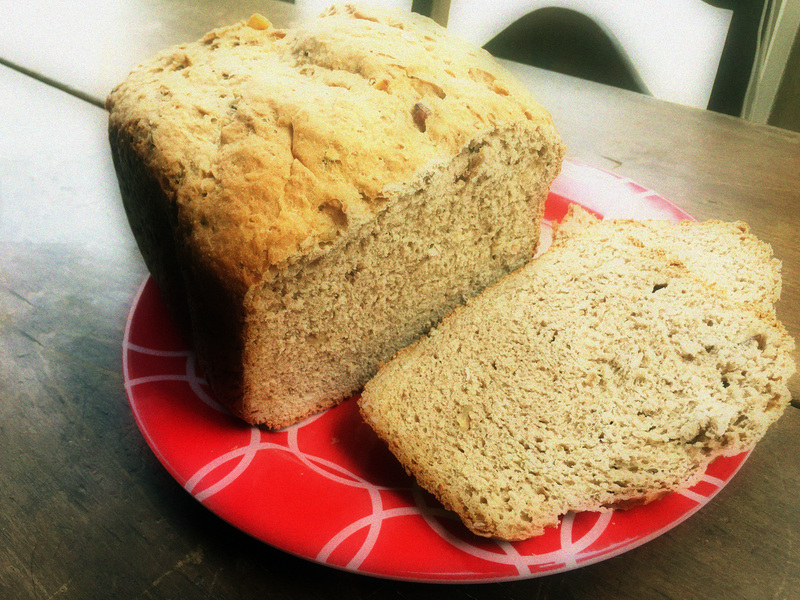 The loaf didn’t bake up very high, it has a nicely browned, and nubby exterior, a result of the nuts and oats, to be sure. It feels rather heavy for its size, so that will be something to bear in mind when the tasting results come back. So tasty, but dry. All in all, a good result though. I anticipate which loaf I receive.